The name of this recipe really says it all. Do I even have to describe how divine this flavor combination is? 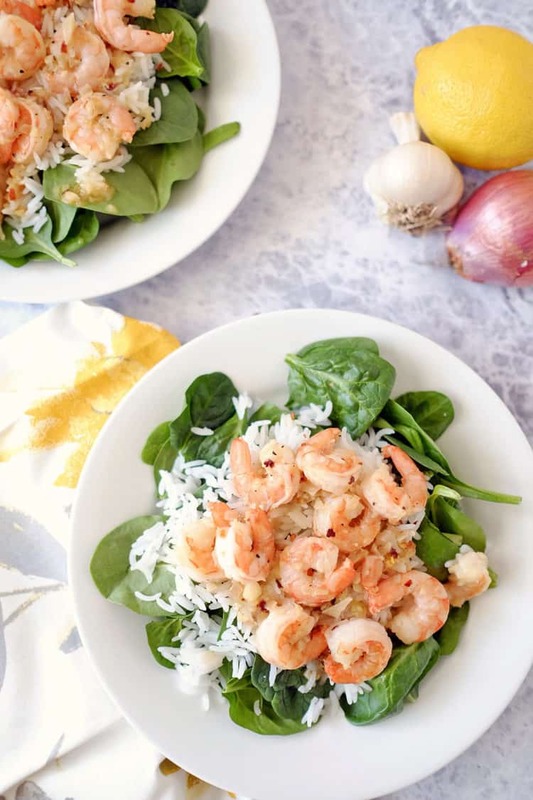 Garlic + butter + shrimp – yes please. Sometimes the simple recipes are the best. 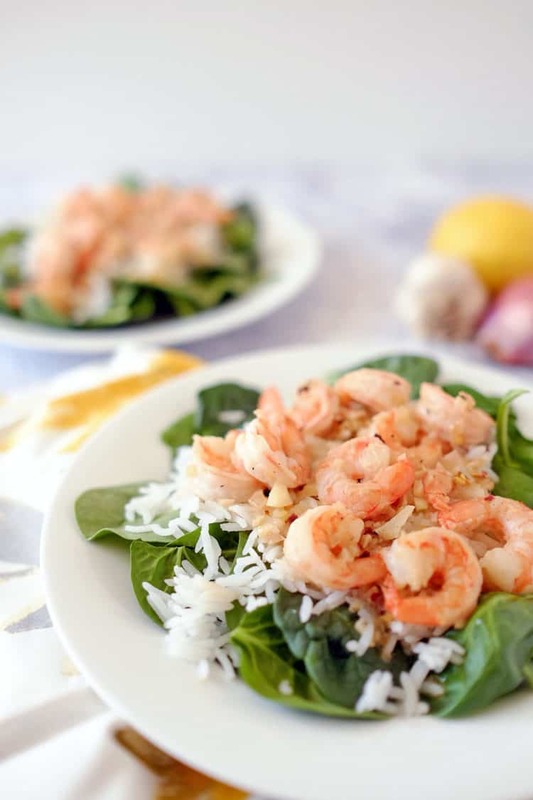 This garlic butter shrimp is easy to make and is so flavorful and fragrant. Your family will feel like they have been transported to a gourmet restaurant when you serve this meal up at the dinner table. The subtle ingredients of shallot and white wine mix perfectly with the bold flavors of garlic, lemon and butter. There’s even a touch of red pepper flakes added in for just a hint of spice. We used already cooked shrimp so all we had to do was heat everything up and it was done and on the table in no time. The sauce cooks up quickly and smells and tastes so amazing! Your stomach will start to growl as the butter melts in the hot pan and mixes with the shallots and garlic to fill your kitchen with some drool worthy smells. 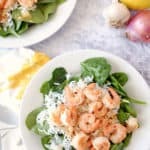 You can eat these garlic butter shrimp on their own, over a bed of lettuce for a salad, with zucchini noodles or even over rice if you eat rice. They are easy and versatile, which is a combination we love. Plus, you only use a little bit of wine in the recipe, so the rest is there for you to drink with the meal. Now that’s what I call a win-win! Give this garlic butter shrimp a try, and let us know how it goes by leaving a comment below. Tag us on Instagram @realsimplegood so we can check it out! First, prep your rice, zucchini noodles, salad or whatever you are having with the shrimp. Set aside. Once the pan is hot, add in 1 tbsp. of the butter to melt. Once the butter has melted add in the shallot to cook, stirring occasionally. Cook until the shallot softens and becomes translucent, about 3 minutes. Stir frequently to prevent burning. Add in the garlic, cook for about two minutes. Stir frequently to prevent burning. Next, add in the remaining butter, lemon juice, wine and red pepper flakes. Season with salt and pepper. Stirring frequently, simmer the sauce for 3-4 minutes until it cooks down a little. Add in the shrimp to warm up for a couple of minutes. If using fresh shrimp, cook until the shrimp just turns pink throughout, about 5 minutes total. 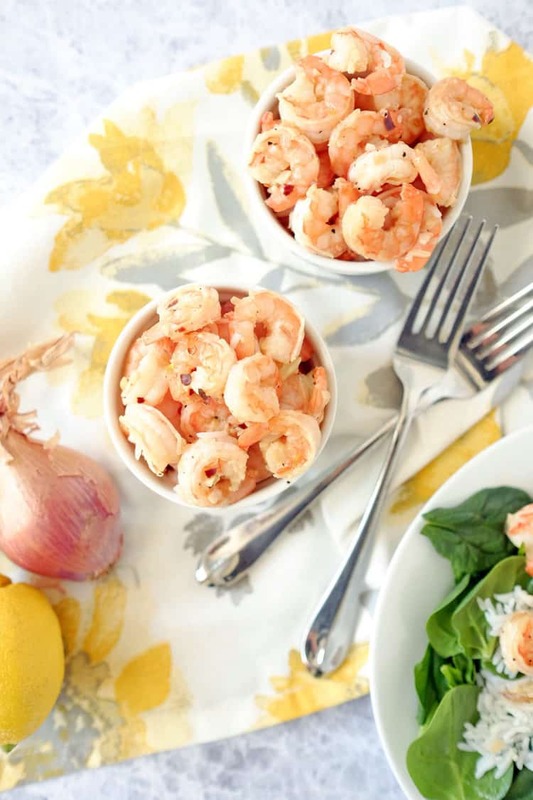 Serve the garlic butter shrimp with a few spoonfuls of sauce.